The Enneagram ...info from the underground. None of us has a firm grasp on the nature of reality. Most of us don’t even know who we really are. Our view of our world is for the most part, a restrictive one. Because our views of ourselves and the world around us are so ingrained, we rarely notice the limitations of our ways. Our ways become diluted background noise, much like the air we breathe. The Enneagram of Personality is represented by a nine pointed symbol that can help us become more aware of what and how we are. 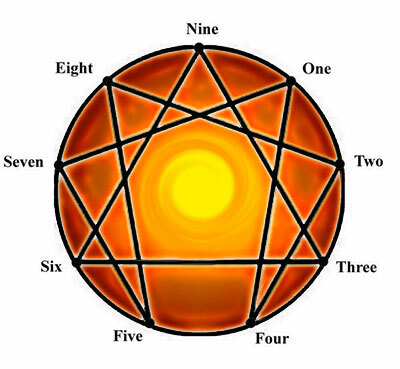 It describes nine Enneagram types – essentially nine ways of being. Often called “fixations”, these nine ways of being can show us what it is that we don’t readily see in ourselves – ways that are not quite in touch with our real selves. Our fixations are primarily defensive in nature and arise as we attempt to negotiate a world which feels threatening to us when we are young and vulnerable. They are thus basically compensatory, and once they are established become automatic and mechanical. While they help to protect us when we are young, they continue to exist long after they have served any useful function and they serve to disconnect us from our true inner selves. It is not clear why we acquire the precise fixations that we develop; they seem to arise from some combination of innate predispositions, early conditions surrounding our nurturance and, perhaps, spiritual conditions which we do not entirely understand. But, because these ingrained strategies for negotiating the world are rigid, and developed to serve the needs of ourselves when we are immature, they cannot serve as effective means for negotiating life. They lead to pain, suffering and unhappiness. If we are able to tap into our inner strength, our motivations become pure and our actions truly effective. The Enneagram also describes our unique strengths. The nine different ways of being, or “energies”, all have both negative and positive aspects contained within them. When we are unbalanced, we are stuck in our distorted views, and act in accordingly distorted, limiting ways. When we are more balanced, we are more in touch with the real self, often referred to as our “essence”. We are then less limited in our approach to experience. We are more closely in tune with actual reality, and the gifts of our enneatype start to shine. Each of us has all nine energies within us, however, one of these energies is usually quite dominant and will manifest in type specific ways. This makes the Enneagram a great tool for trying to understand ourselves and for trying to understand where other people are coming from when they appear to be so different from ourselves. G.I. Gurdjieff was the first person on record to introduce the Enneagram symbol to the public. Later, Oscar Ichazo used the Enneagram to present his Arica Theory, the source from which the Enneagram of Personality was developed. Since then, many people, such as Claudio Naranjo, Helen Palmer, A.H. Almaas, Don Riso and Russ Hudson, have given their own interpretations and discoveries related to the system. This site was constructed to provide some basic information, as well as some harder to find information. On the left, you will find a menu of links for enneagram type descriptions, instinctual subtype descriptions, historical insights, and reference materials. This site will continue to grow with more information in the future. Look forward to articles on topics such as wings, lines, and enneagram movement. This is a beginning. We hope you enjoy exploring the site. Just a note to say I am still living in my body…for those interested in my person. Since my EI departure from madness I continue discovering the relationship of the Enneagramic Laws 3 and 7, Hurrah! Here comes my book. LOL.